Level of phospho-proteins in RTK and PI3K–Akt–mTOR pathways in treated tumours, detected with western blot. Nature, 2017, 728-732. Dactolisib (BEZ235, NVP-BEZ235) purchased from Selleck. A, ANOVA of IC50 values of the dual PI3K/mTOR inhibitor NVP-BEZ235 in 23 melanoma cell lines showing no significant difference in sensitivity to this compound in B-Raf mutant and Braf wild-type cells. B, decreases in pAkt and pP70S6K in a dose and time-dependent fashion in 2 melanoma cell lines treated with NVP-BEZ235. pP70S6K levels are undetectable at all concentrations and time points studied, whereas levels of pAkt start rising again after 4 hours of drug exposure in a dose-dependent fashion. C, clonogenic assays in 2 melanoma cell lines (YUVON and YUSIK) treated with NVP-BEZ235 at different concentrations. NVPBEZ235 was effective in inhibiting colony formation at low nanomolar concentrations. Clin Cancer Res 2010 16, 6029-6039. Dactolisib (BEZ235, NVP-BEZ235) purchased from Selleck. Relative kinase activities of p110α mutants and the inhibitory effect of PI3K inhibitors against hotspot mutants of p110α. A, recombinant FLAG-tagged PI3K p110α/p85α protein complex produced in 293T cells was immunoprecipitated , and the immunoprecipitates were used for the quantitative PI3K-HTRF assay (32). B, effect of three PI3K inhibitors (ZSTK474, LY294002, and NVP-BEZ235) on the enzymatic activity of two hotspot mutants (E545K and H1047R) p110α compared with the wild-type. No striking difference was observed in the IC50 concentrations of these inhibitors between wild-type and mutant p110α. Cancer Res 2010 70, 4982-4994. Dactolisib (BEZ235, NVP-BEZ235) purchased from Selleck. 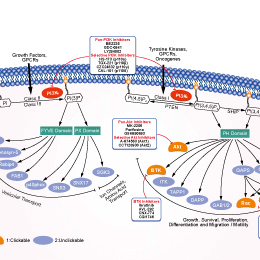 ZSTK474 and GDC-0941 selectively inhibit class I PI3K over mTOR. (A) Inhibition profiles of the selected five PI3K inhibitors for mTOR. Data shown are mean±SD (n = 3), representative of 2 or 3 independent experiments. (B) IC50 values of the PI3K inhibitors for mTOR. (C) Selectivity of each PI3K inhibitor for PI3Ka over mTOR. The selectivity index is expressed as the ratio of the IC50 value for mTOR over that for PI3Ka. The IC50 values of ZSTK474, NVP-BEZ235 and LY294002 for PI3Ka are 0.016, 0.007 and 0.6 μM, respectively, as reported previously by us. Eur J Cancer 2010 46, 1111-1121. Dactolisib (BEZ235, NVP-BEZ235) purchased from Selleck. Three-dimensional responses of MCF7/IGF-1R cells to TAM (1 μM), E2 and IGF-1. Compared to parental MCF7 cells (a), MCF7/IGF-1R cells (b) in three-dimensional (3D) culture formed bigger acini in response to IGF-1 stimulation and displayed significant TAM resistance when treated with TAM (1 μM) + E2 + IGF-1, which was removable by kinase inhibitors BMS-536924, U0126 and BEZ235 (c). Cells (10,000/well) were seeded in 96-well plates. Acini were formed on 100% Matrigel and cultured for 14 days in starving medium containing 2% Matrigel and 5% charcoal/dextran-stripped fetal bovine serum with the treatments as indicated. Concentrations used: TAM (1 μM), E2 (1 nM) and IGF-1 (100 ng/mL). Confocal image original magnification, × 20. Red, rhodamine phalloidin (actin). Blue, Hoechst blue stain. Results are representative of two individual experiments. Breast Cancer Res 2011 13, R52. Dactolisib (BEZ235, NVP-BEZ235) purchased from Selleck. TAM (10 nM) agonistic behavior in MCF7/IGF-1R cells is not inhibited by phosphatidylinositol 3-kinase/Akt inhibitor BEZ235. (a) Inhibitory effects of kinase inhibitors BMS-536924, U0126 and BEZ235 on agonistic effect of TAM (10 nM) in the presence of IGF-1 (100 ng/mL). **P < 0.01. (b) Inhibitory effects of phosphatidylinositol 3-kinase (PI3K)/Akt inhibitor BEZ235 at various dose ranges on IGF-1R signaling. (c) Agonistic behavior of TAM (10 nM) in response to BEZ235 kinase inhibitor. (-), no BEZ235. Results are representative of three independent experiments. Data are expressed as means ± SD. Breast Cancer Res 2011 13:R52. Dactolisib (BEZ235, NVP-BEZ235) purchased from Selleck. (B) The effects of AZD2014, BEZ235, lapatinib, LEE011, pazopanib on PI3K/AKT signaling in sarcoma PDC line were determined by immunoblotting analysis. Cells were treated with 1 μM of the indicated drugs for 72 h.
Transl Oncol, 2016, 9(3):197-202. Dactolisib (BEZ235, NVP-BEZ235) purchased from Selleck. The effects of LY294002, rapamycin and NVP-BEZ235 on activation of PI3K-Akt-mTOR pathway in hepatocytes. (a) The mRNA expression (PI3K, Akt, mTOR, raptor) by Real-Time PCR, (b) protein expression (PI3K, Akt, mTOR, S6K) by ELISA kits; (c) protein expression of S6K and P-S6K by western blotting. The different letters indicated significant differences (P <0.05). LY = LY294002; rapa = rapamycin; NVP = NVP-BEZ235. Animal, 2016, 10(8):1319-27. Dactolisib (BEZ235, NVP-BEZ235) purchased from Selleck. After starved in serum-free medium for 24h,breast cancer cells incubated with the indicated concentrations of BEZ235 for 3h,followed by 20-minute stimulation of 100ng/ml EGF. Dr. Zhang of Tianjin Medical University. Dactolisib (BEZ235, NVP-BEZ235) purchased from Selleck. FIG. 4. Phospholipase A2 group 4A (PLA2G4A) expression was increased after BEZ235 treatment in basal-like xenografts. The bar graph shows the quantification of the immunoblots (mean±SD). PLA2G4A, Ethanolamine kinase 1 and 2 (ETNK1/2), Choline kinase alpha/beta (ChoKA/B), and β-actin protein expression were examined by immunoblotting of tissue samples after MRS experiments [control group (n= 5) and BEZ235-treated group (n=7)]. This demonstrated a higher expression of PLA2G4A protein ( P=0.005), but no changes in ETNK1 and ChoKA/B in samples from basal-like xenografts treated with BEZ235. Dactolisib (BEZ235, NVP-BEZ235) purchased from Selleck. Maira SM, et al. Mol Cancer Ther, 2008, 7(7), 1851-1863. Roper J, et al. PLoS One, 2011, 6(9), e25132. Roulin D, et al. Mol Cancer, 2011, 10, 90. Cho DC, et al. Clin Cancer Res, 2010, 16(14), 3628-3638. Zhang Y, et al. J Cell Physiol, 2012, 227(1), 35-43. Shoji K, et al. PLoS One, 2012, 7(5), e37431. Chiarini F, et al. Cancer Res, 2010, 70(20), 8097-8107. Toledo LI, et al. Nat Struct Mol Biol, 2011, 18(6), 721-727. With difficulties in dissolving BEZ235, How can I improve its solubility? For in vivo study, we suggest the vehicle solution NMP/polyethylene glycol 300 (10/90, v/v). Please dissolve BEZ235 in NMP as more as possible. You can sonicate and warm it in water bath for a while. Then dilute with PEG 300. Duvelisib (IPI-145, INK1197) : PI3K δ, IC50=1 nM. GSK2636771 : Potent, orally bioavailable, PI3Kβ-selective inhibitor, sensitive to PTEN null cell lines.